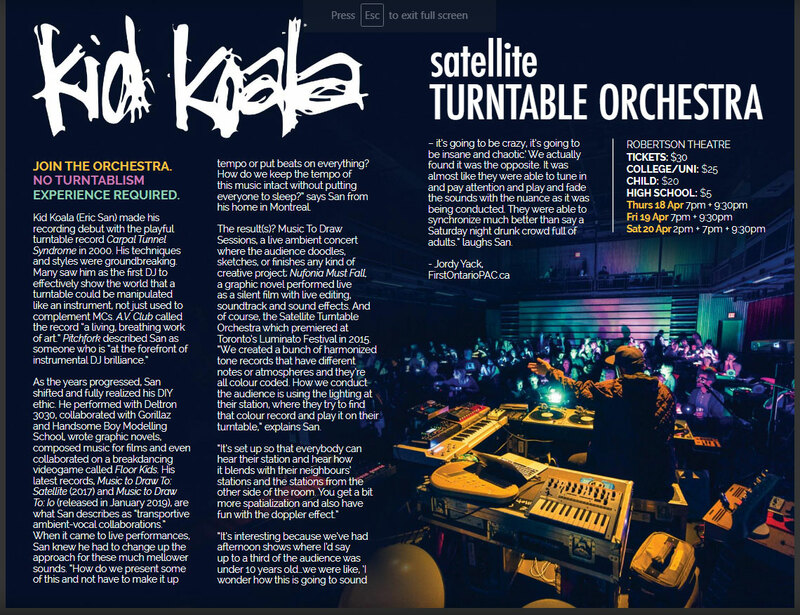 Create an ambient vinyl orchestra with Kid Koala! Create an ambient vinyl orchestra with Kid Koala! This very special interactive show brings audience members of all ages into the sound making process. Each person is seated at stations equipped with a turntable, effects box and a small crate of colour coded vinyl records. Through subtle coloured lighting changes in the room, EVERYONE is cued to play along, becoming an integral component to the soundtrack as the story unfolds. Kid Koala (Eric San) is a world-renowned scratch DJ, music producer and award-winning graphic novelist. Kid Koala has toured with the likes of Radiohead, Arcade Fire, and the Beastie Boys as well as contributing to the scores for Shaun of the Dead, Scott Pilgrim vs. The World, Looper, and The Great Gatsby. Koala recently created the soundtrack for the breakthrough breakdance battle video game on Nintendo Switch and his latest albums Music To Draw To: Satellite and Io, have received exceptional reviews and praise for their “dreamlike” sounds.